It seems like it's going to be a hot summer in Jerusalem. The extreme Haredi community has once again taken to the streets in their attempt to close HaNeviim Street, The Prophets' Road, to traffic on the Jewish Sabbath. 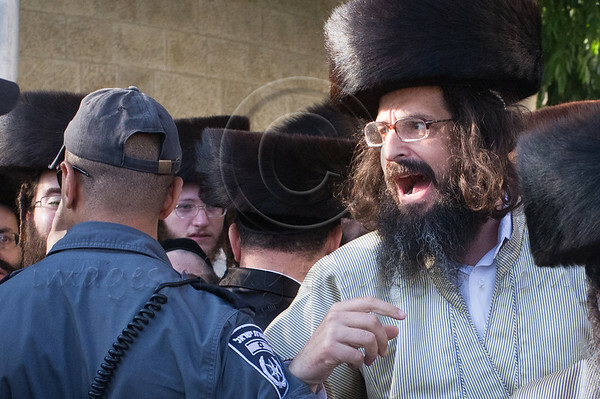 Police were ready in sufficient force to prevent the closer of the street, scuffling with demonstrators, pushing them back into the Geula neighborhood and making at least two arrests. Haredi men shout "Shabbess" at policemen, drivers, and journalists as they riot, unsuccessfully trying to close The Prophets' Road (HaNeviim) to vehicles on the Jewish Sabbath. Jerusalem, Israel. 23/07/2011.